Last week we posted a photo of a group of Great Blue Herons, Cormorants, Snowy Egrets, Little Blue Herons, and Great Egrets all foraging together on a rainy morning. The Great Blue Herons are so perfectly camouflaged when perched on the rocky shoreline and we asked how many GBH folks could see. 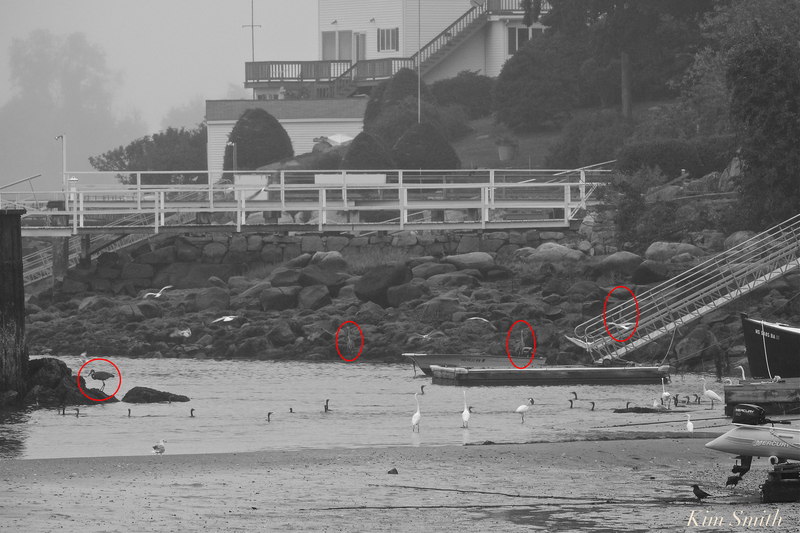 Reader Julie W. saw the most and she even sent the photo back with the Great Blues circled. Thank you Julie for taking the time to do that!! This entry was posted in Birds, Birds of New England, Cape Ann Wildlife and tagged #sharetheshore, Ardea herodias, Beautiful Birds of Cape Ann, egrets, Great Blue Heron, HERONS, WADING BIRDS on November 6, 2018 by Kim Smith.